Established in 2011, Natural Gas World is an independent specialized platform dedicated to bringing you the most essential, accurate and reliable information on global gas matters. 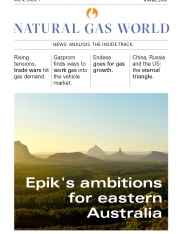 NGW is a platform dedicated to provide natural gas stakeholders with access to world class content: comprehensive coverage of the latest natural gas, LNG and energy transition developments, expert analysis, complemented with thought leadership events for in-depth engagement and discussion of the most topical issues affecting the natural gas community. Our editorial team comprises accomplished and talented journalists, analysts and experts who provide daily coverage on the latest developments in natural gas and LNG, offering unique and independent insight to topical and relevant gas matters from around the world. In partnership with our network of academic institutions, nongovernmental organizations and think tanks, our engagement team develops different event formats and platforms where our stakeholders can meet to exchange views, ideas and thoughts. We believe that meaningful conversation can assist in moving forward the gas debate globally. We seek to provide policy/decision makers, suppliers, regulators, academics and consumers with a comprehensive approach to all the main actors in the natural gas sector and a space where their voices can be heard directly and without distortion.